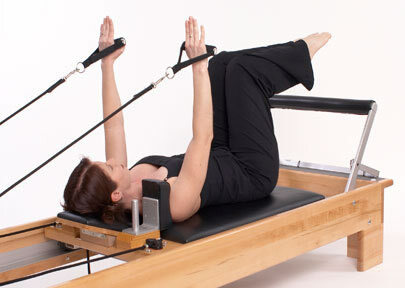 The Reforrmer carriage glides forwards and backwards on rollers and uses springs for resistance, along with other attachments for a wide range and variety of exercises and positions (lying down, seated, standing). It facilitates hundreds of exercise variations, is no-impact (therefore easy on joints), allows for modifications for those with injuries or conditions. Allows three dimensional movement and is suitable for a wide variety of clients (from rehab to professional athletes). The Reformer also facilitates balance strength and flexibility, provides eccentric and concentric muscle contraction, improves postural alignment and facilitates core conditioning. Physiotherapists have used the reformer for some years now as it enables the rehabilitation client to engage the exact muscle required to be isolated and engaged in order to balance and strengthen the body. Melbourne Pilates Group Reormers have the extra component of “Jump Boards” to facilitate a cardio work-out on the reformer. 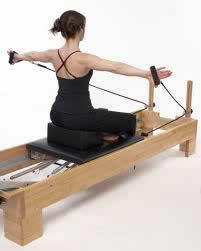 A low impact cardio session can be enjoyed on the reformer – laying down. The REFORMER can deliver toned arms and legs without ever lifting a weight again. This is great to improve bone density and posture and fight ageing. The REFORMER provides resistance enough to tone your body from head to toe. Attending two classes per week will transform your body! Professional ballerinas have embraced the REFORMER for almost 100 years now. Working out on the machine strengthens and stretches your body without bulking your muscles as weights can. The REFORMER creates muscles that are long and lean as it works both a concentric and eccentric way to produce a streamlined body. With expert instruction, exercises can be modified to be gentle enough to suit the elderly and unfit right through to challenge a supreme athlete.